There are several aspects to having a large family that remain consistent. Food doesn’t tend to last long, there is always an argument over who is sitting in who’s seat and nobody ever knows who did something they shouldn’t have as it wasn’t them, whoever they are or whatever has happened. The laundry basket is never empty for any period of time, be it hours or rather, minutes. There are always half a dozen cups lined up on the kitchen counter top and nobody ever remembers which cup belonged to them, and there is always some chore or other to do. So, if any house is perfectly suited to testing out household appliances, it is ours. Introducing the Vax BLADE 2 MAX: What is it? There is no doubt that technology is doing well in making things more compact, lighter, and increasingly aesthetically pleasing. But there is little point in meeting those criteria when overall function, efficiency and practicality is at stake. After all, when we purchase a product, the ultimate question is does it do the job it is supposed to do, and does it do it well? 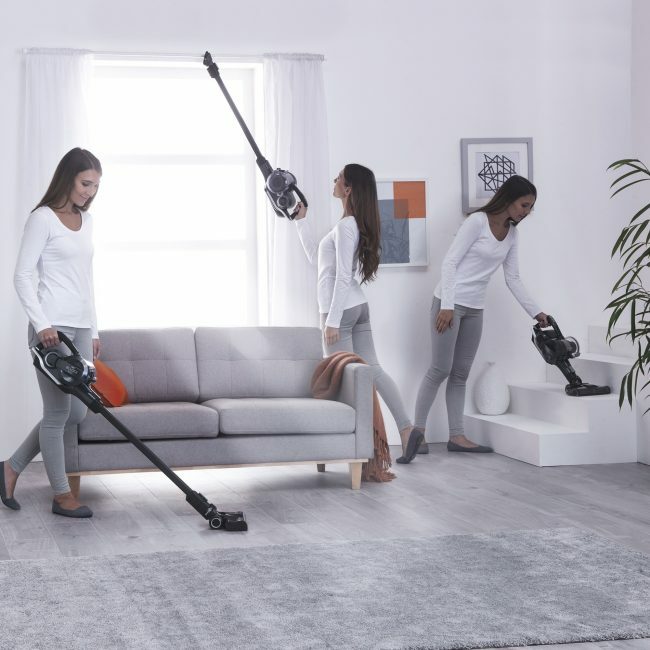 The Vax BLADE 2 MAX is a convenient, lightweight stick vac alternative to the traditional heavy, cumbersome vacuum cleaners that we are used to. Measuring just 24cm wide and 155cm tall, with a depth of only 18cm and a weight of 3.1kg, the machine can be easily stored using the wall mount included in pack. Hanging it close to a power source will enable quick and convenient charging of the machine in only three hours. 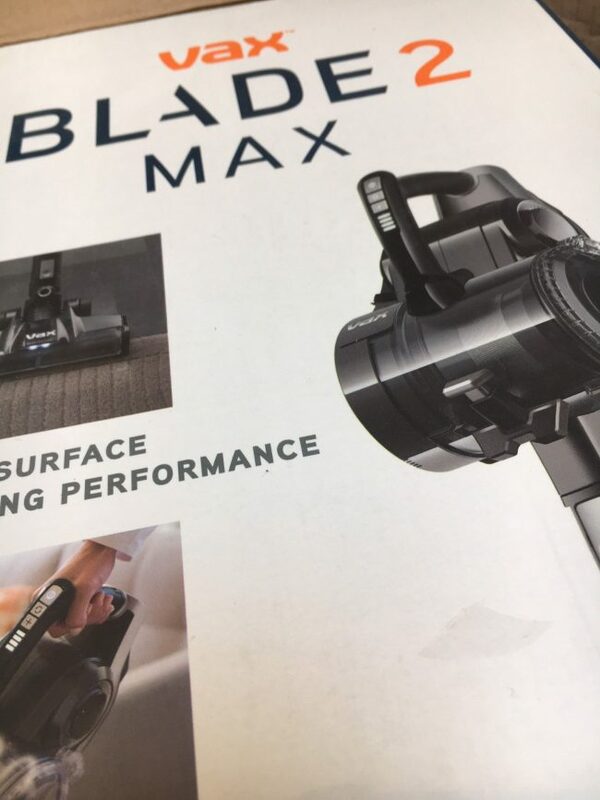 Despite its size and weight, the Vax BLADE 2 MAX feels relatively robust and durable which is a tremendous advantage in a home like ours where vacuuming is often a several-times-a-day event. Oh, how I envy those who say they have done their vacuuming for the week. Done your vacuuming for the week? Do you live elsewhere during that time? If we didn’t vacuum for a week we would need a search and rescue team to dig us out. Or perhaps we are exceptionally filthy creatures? I dare not ponder too long on that question. Assembling the machine is quick and simple, with the reach wand (the stick bit) clicking into the handheld and locking into place securely. There is a crevice tool storage caddy that clips onto the reach wand, holding extra tools conveniently in place without them causing any obstruction or hindering use of the machine itself. Charging the machine fully for the first time took a little over 3 hours to do. As the Vax BLADE 2 MAX doubles up as both a stick vac and a handheld, it can be charged in either form, i.e. whilst mounted onto the wall or independently of the reach wand as a handheld machine. Four battery indicator lights display the battery charge level, each one lighting up separately as charging continues. Once fully charged all the lights on the indicator will go out so don’t worry if, like me, you expect the fully charged machine to display four lights and you immediately assume you’ve done something wrong because they’ve all gone off. 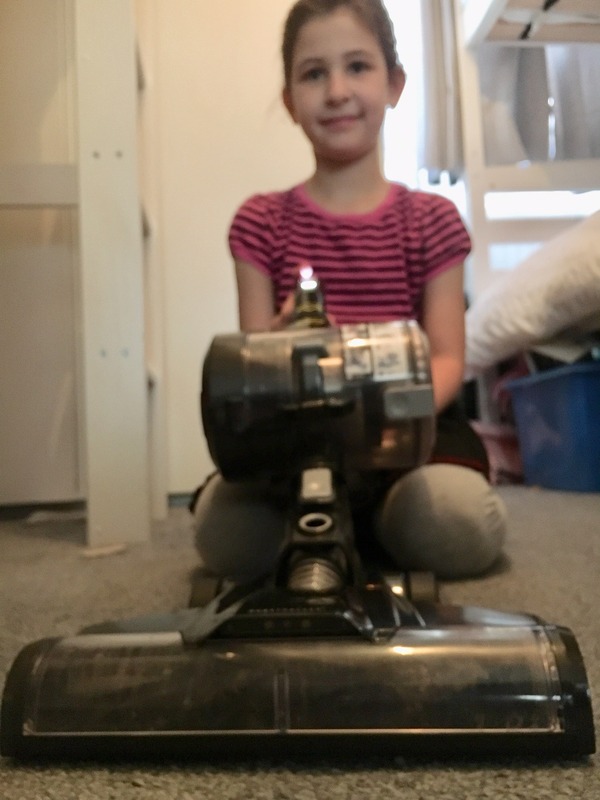 I don’t want to rock Vax’s legal boat or anything but (whispers),*the machine is light enough that younger kids can be bribed to do housework too. * The ‘hazards involved’ of them not keeping their bedrooms tidy now that there is a machine that they can take upstairs all by themselves any time at all, include no treats, Kindles or whatever else I feel like depriving them of. My children probably aren’t as keen on the Vax BLADE 2 MAX as I am. Be prepared that yours probably won’t be either. Using the machine is very simple to do. In practice, or according to our review at least, the kids continue to leave a trail of devastation and destruction throughout the house as I tackle the floors. As is generally the way, the handle needs to be pulled back in order to recline the machine. Press the ‘On’ button, the machine comes to life and the lights illuminate, indicating the level of charge the machine has left. 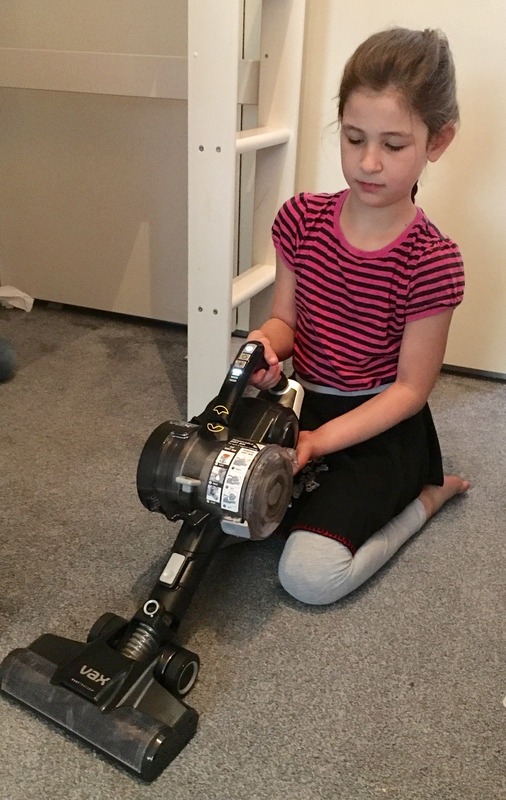 The power brush needs to be set according to the surface it is required to vacuum; ‘On’ for carpets and ‘Off’ for floorboards and hard surfaces. This is done with little effort thanks to the convenient placement of the buttons on the handle, enabling you to conveniently move between surfaces with minimal fuss and bother. Libby could not wait to try out the new Vax BLADE 2 MAX. The Vax BLADE 2 MAX does not like hoovering up LEGO pieces or other small toys that the children insist they did not leave on the floor, so I assume must have appeared there a-la-Toy-Story. 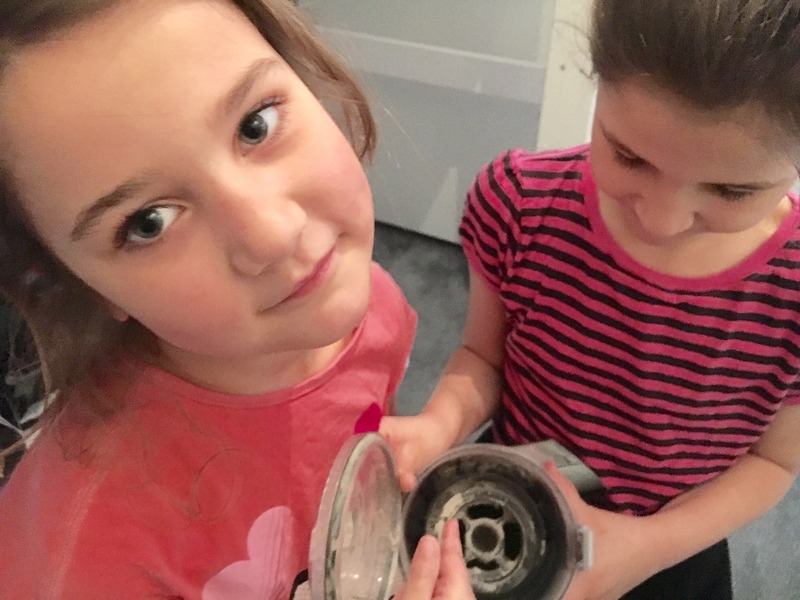 The volume of the machine is also low enough that the kids can actually hear you yelling at them telling them repeatedly to tidy up their crap before it is sucked up, even though they pretend not to. Libby insisted that the carpet had been cleared of all toys and debris. To be fair, Vax could design a super-silent machine with built-in megaphone and my kids would still not hear me telling them to tidy up. Unless I kept the machine running whilst I locked myself in a room with a chocolate bar. You can bet that they will hear that being unwrapped from 100 miles away. The battery has a total run time of approximately 45 minutes from full charge. This, with its 40 volt power, means we can do the entire house twice from each charge. 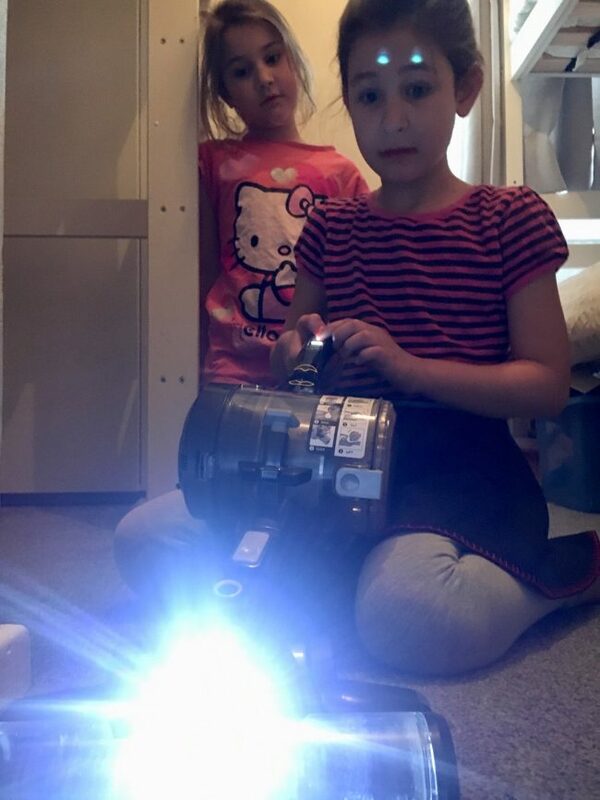 Libby was shocked when the Vax BLADE 2 Max’s headlights told us otherwise. The dirt container has a 0.6 litre capacity and emptying it is quite effortless. I do sometimes worry about the durability of the containers as some feel quite flimsy but it seems this is robust enough to reassure me that it will be able to take a good degree of use over time. It can also be washed out, helping to keep the machine functioning to its maximum capability. I haven’t found either a decreasing battery level or an increasing amount of dirt in the container to affect the overall performance of the machine. So far, I have been impressed with its effectiveness on all surfaces. 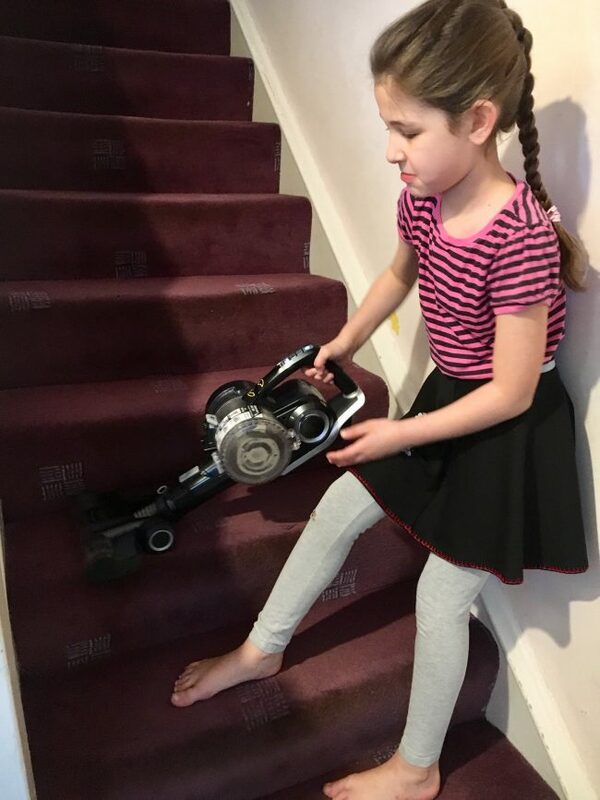 The standard power setting is more than adequate for hard floors but when it comes to carpets and rugs I have found that utilising the boost combined with the brush bar makes for a better performance. This combination creates a setting powerful enough to clear even the girls’ Rapunzel-like hair from the carpets when usually the strands seem to grow roots and dig themselves well into the carpet pile. Bel and Libby conceded that perhaps their carpet was not as clean as they had initially thought. Thanks, Vax. (NOT!). One particular advantage to this stick vac is the ability to use it as a handheld. So far, it has offered the reliability and power that handhelds normally lack, so tackling stairs, curtains and upholstery and awkward corners is all that much easier. This also makes it easier for young children to transport and use – until the novelty of using it wears off (approximately 1 minute and 27 seconds). The 45 minute run time is adequate enough and isn’t an issue if the machine is put on charge regularly. However, I have already forgotten to charge it up and the red light has come up soon after use on a couple of occasions. That’s down to me, not the machine, but a bad memory is somewhat of a disadvantage when you have a cordless appliance depending on it. So far, my verdict on the Vax BLADE 2 MAX is quite positive. With the exception of the wall mount, which is perhaps not as sturdy as I would like, the machine itself seems to be effective given its size and weight, particularly when used in the boost mode. I would admit that whilst I generally do prefer the boost mode, I find it a handy machine to whizz around the house with for a quick spruce-up even on its normal setting. Independent lab data has in fact proven the Vax BLADE 2 MAX’s high performance, ensuring it heads the list of the top 20 best selling hand held vacs. One thing that I do find a little disappointing is that it lacks the ability to stand up alone. 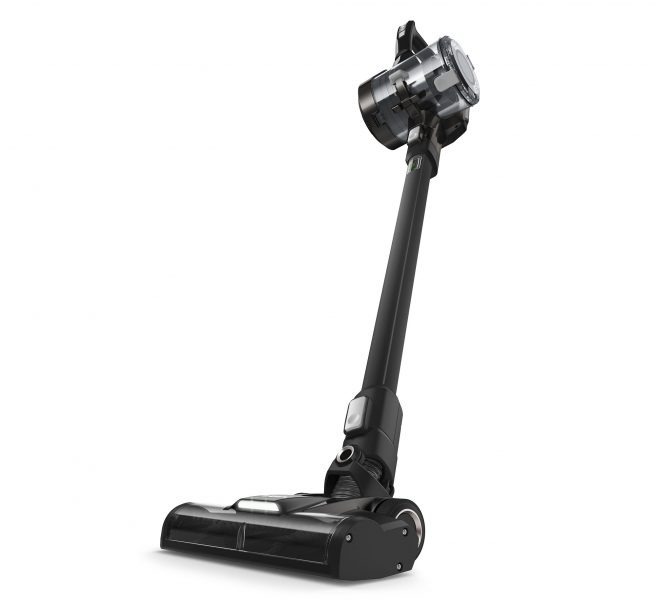 A self-supporting stick vac is more appealing to me as I would like the option to store it in a corner of a different room without having to prop it up against something, or having to carry it back to its wall mount. Also, I forget that it isn’t freestanding until I hear the ‘clunk’ of it hitting the floor as soon as I begin to walk away. As with any household appliance, only time will tell as to whether it will provide the longevity and dependence required over the long-term, especially when up against such frequent use that a household like ours requires. Please do check back in a couple of months when I will update this review accordingly with my ongoing feedback. The Vax BLADE 2 MAX retails for £249.99 from all good sellers. 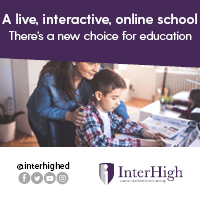 Find out more about it here. *Thank you to Vax for providing us with the Vax BLADE 2 MAX for the purpose of this review.